Pay Per Click (PPC) campaigns - if executed with the customer’s needs, concerns and pain points in mind - can create the right kind of awareness around brands, products and offerings. This, however, is only true when keeping your target audience in mind every step of the way - or funnel, as we like to say in marketing. In this blog, we’ll delve into how your cyber security startup can derive maximum marketing return on investment (ROI) from a measured and customer-focused PPC campaign. Who exactly are you targeting? Is it the potential client’s CIO, or some other professional in the company? You need to figure out who can make buying decisions or at least recommend your product or service. Once you know which position they hold, go into the details of their job. Ask yourself, “What are their objectives?” or “What about their jobs keep them up at night?” or “What are their chief motivators?” The answers to questions like these allow you to get a new vantage point on your targeted persona, giving you the insight you need to create compelling PPC campaigns that speak to their unique needs. Social sites such as LinkedIn are an invaluable resource to start identifying conversations your audience is involved in and where their immediate focus lies. The most important of these details will be your customers’ pain points. These challenges and concerns can be discovered through a variety of methods. They may be as direct as surveys to current clients or as indirect as an exploratory trawl through industry forums. Social listening tools are also particularly useful for monitoring conversations about your industry and brand. Keep an ear to the ground, and you’ll quickly learn what concerns your customers. Persona workshops are another effective way of making real connections with your customers. These workshops typically involve delving into the ideal customer’s objectives, aspirations and challenges in their roles. You can download Hubspot’s free persona template to help you personalise your brand messaging here. Once you know who actually is in a position to both purchase your product and benefit from it, you can segment your customers according to position and pain points. When you are finished, you should have a very clear picture of who your customers are. By tailoring messages specifically for these archetypes, you can ensure the greatest relevancy of your messages. You can do this further by examining which stage of the buyer’s journey your identified targets are since not every potential buyer will be in the same stage of the decision-making process. An earlier post discusses the importance of segmenting leads according to their position in the sales funnel. When you know who your customers are, you need to develop two types of conversion assets: content offers that speak to the needs and concerns of your customers, and a freemium demo or trial subscription of your product for use at a later stage in your sales funnel. It’s very important that your content offers do not talk about your product, but only your clients’ pain points and the possibilities for remedy. Check out this link to our guide to the top 25 Lead Generating Tips Cybersecurity Companies as an example. A PPC campaign is only as effective as its keywords. You need to choose high-quality keywords to ensure the greatest ROI on virtually any online campaign. Keyword research should reveal three essential elements: relevancy to product, keyword search volume, and competition. You want keywords that ensure a relevant user search journey, get searched for frequently, and have relatively low competition. But, you also need to ensure that they drive the right traffic based on informational search intent. This blog by Tenscores goes into greater depth on this topic. Keyword research tools, such as Hubspot’s Keyword Tool, help companies refine their SEO strategies and build more effective marketing campaigns, blog pages, websites and other digital assets. If you want to know what your competitors are up to and find the most profitable keywords, or even eliminate the least effective ones, tools such as SpyFu provide powerful keyword research, PPC campaign optimization and ranking increase functions by indexing billions of results from millions of domains. Your PPC ads need to be designed specifically for content downloads. Word them in such a way that users know that they’re being offered content of real value. These should promise to solve your customers’ problems and seem too good to pass up. Again, it’s important to test your ads for how they rank for informational intent keywords. I used Palo Alto’s PPC ads as an example of a Google ad campaign executed in exemplary fashion in a recent blog. Remarket to users who have visited your content offer landing page, engaged with your ad, and, of course, have downloaded your content. But not with the same message. Though it is possible to target all past visitors with a single product ad, this approach would be very limiting. You have the power to show web users ads designed for specific stages of the buyer’s journey, and your remarketing efforts would be most effective if they exposed previous visitors to tailored messages based on their past interaction with your website. Finally, you have to determine which content offers have led to the greatest number of interactions between your brand and your target audience. Look at the success rate of both PPC campaigns and the conversion assets themselves. How many people clicked on the PPC ad? How many downloaded the content? How many requested a demo? Look at all these to determine which elements are best performing and amend those that aren't. 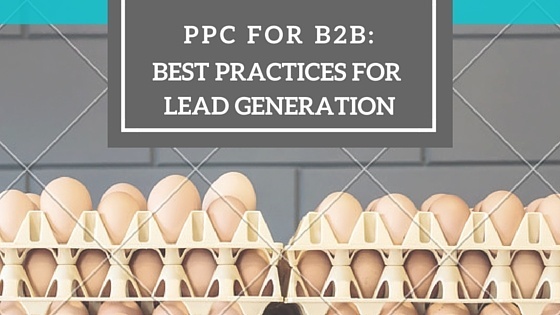 The best PPC for B2B campaigns are constantly analysed and tweaked to deliver an even better ROI. Inbound marketing is a process which undergoes constant refinement due to the constant shift in the way consumers interact with brands in the information age. If you would like to learn more about PPC for B2B and how B2B paid lead generation can be optimised for your inbound marketing campaigns, book a free consultation with one of our marketing experts today. Yonatan is our resident PPC guru. If it's about optimization, analytics or cooking (food, not numbers) he is your man. When he's not in the office, you'll find him on the court playing semi-professional basketball.